YMCA Interpoint Hostel - Join us! Join us and spend some wonderful summerdays of 2019 in Copenhagen. Spend your summer in Wonderful Copenhagen. Meet lots of new people from all over the world. Gain some good hostel working experiences for your CV. BTW: Did we remember to mention that you will get food, lodging, pocket money (350 DKK/week) and free experiences with the other staff as well? 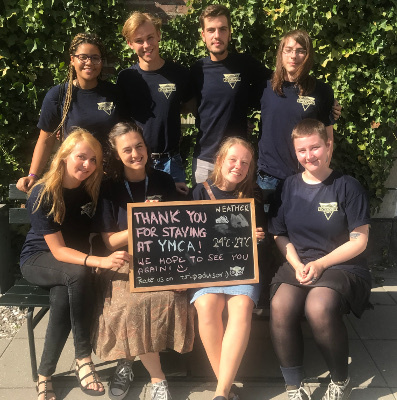 Do you want to help give other, primarily young, people a great summer experience in Copenhagen? Are you a team player not shy of cleaning and cooking? Then you might be the one we are looking for! Typically our volunteers are 16-25 years old, most being in their 20s. Volunteers and managers - in the happy summer of 2018. Usually there is 4-6 hours of regular work (as described above) every day for the volunteers. So you will also have plenty of time to see Copenhagen with the other staff or hang out at the hostel. The volunteers share the different tasks, so everyone gets to try everything. We have two full time managers that has the daily responsibility of managing the hostel. This year 2019 YMCA Interpoint Hostel Cph is open from 13 July - 7 September. You may come and join us for one week or up to three weeks in the period - whatever suits your summer vacation plans. We had a lot of great applications last year, we look forward to get yours! Feel free to ask us at !